That one will be confusing as H96 Pro is already a TV box, but somebody must have thought that model number was so good, it had to be re-used in another products. So I present to your H96 Pro TV dongle powered by the same Amlogic S912 processor running Android 7.1.1 Nougat. 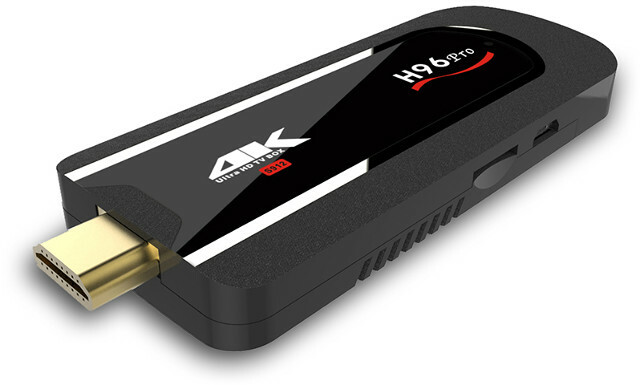 It’s not the first octa-core HDMI TV stick, as we’ve seen MeegoPad A02 (Allwinner A83T) and NEXBOX 809VI (Rockchip RK3368) in the past, but AFAICR I have not come across Amlogic S912 sticks before. As mentioned previously the stick runs Android 7.1.1, and ships with a micro USB cable for power, and a user manual in English. I’m a bit sad they somewhat crippled a 4K TV stick by not using a 802.11ac WiFi module. The product page claims that you can power it from your TV or projector USB port, but that may not always work, as such USB port may not deliver enough power for the stick to work reliably at all times. In the past, I could not even boot using that method with other TV sticks. So plan for an external USB power support to make sure. I would have thought by now that MHL would be a more common features in such TV dongle since many TVs now support MHL. Thermal management may also be an issue in such tight package. 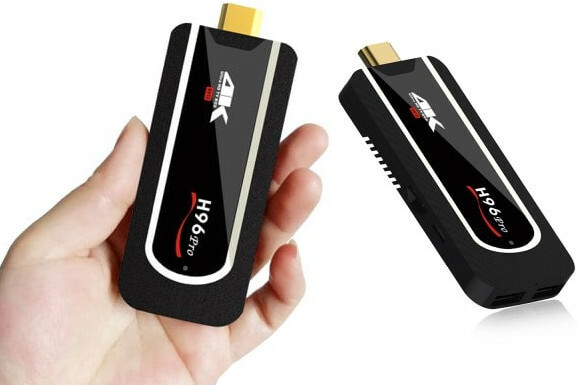 I first found H96 Pro TV dongle GearBest where it is sold for $53.15 including shipping, but Aliexpress has better deals, including one seller offering it for $46.99 shipped. I’ve never really understood the attraction of this form factor. 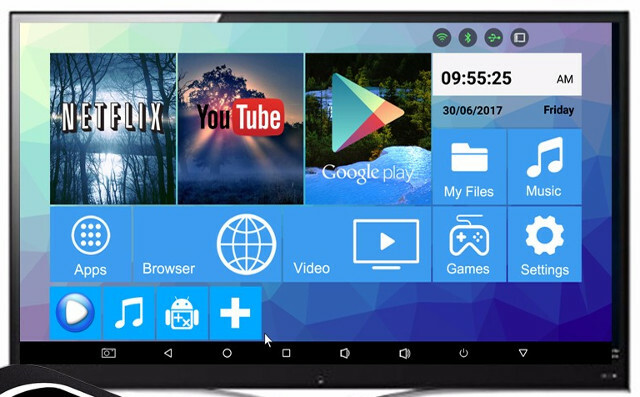 The slightly larger TV box can usually be VESA mounted out of sight behind the TV and offers fewer issues (power, cooling) and more flexibility (USB ports). Very interesting dongle and price on it. I need one like this but with dual band 802.11ac WiFi module. Why would anyone buy those TV sticks/boxes from companies that barely have enough engineering knowledge to copy the SoC vendor’s reference design? Are those device manufacturers even able to build upon the SDKs the IDH’s “release” with the product? It requrires mounting it, cabling it, etc. The stick format has the “appeal” of just plugging it into the HDMI slot and powering it. The ones thinking about it after having futzed with the poor results of most of those devices in this form factor want the small box to do as you describe. P.T. Barnum put it best. How do you navigate the menus? What Android App does it use for video playback? Does it support selecting different audio streams? I currently have 2 ways of playing back video, and both are terrible. First, a Sony Google TV (NSX-32GT1), for whatever reason most video apps won’t even install from the Play store, saying that the TV is an incompatible device. The few video players that did install don’t recognize or can’t play mkv files. The second solution was a Chromecast.. however sending it files from the PC via Videostream has also been unreliable, sometimes because of the format, other times it’s unable to select the 2nd audio stream and/or subtitles. What platform/app can play local mkv files (either attached via usb or network) with audio stream (and subtitile) selection support? You can have it in your pocket and consume or even “work” on any hdmi capable display. There are two issues that may help you. First, mkv files tend to be large and can be reduced by freeware Handbrake into smaller mp4 files. Nevertheless, you can probably play them easily if you connect directly via an ethernet cat6 cable. Second, Plex made an app for the NSX which I bought several years ago. If the latest android plex is not compatible you’ll probably have to get an older version from the developers. This way the processing of the mkv files are done on a local network PC (with Plex installed as a server managing your content). As an aside, if the subtitles aren’t burned into your mkv files you can download subtitles from OpenSubtitles.org. I use freeware tinyMediaManager to scrape them. If the nfo subtitle is in the same folder as the mkv file Plex will give you the option to use it. You can control the device either using the mobile remote app, or an hardware device like an air mouse or wireless keyboard. Kodi should work fine. You can select audio tracks and play MKV files. Subtitles are also supported either within the MKV files or external. If you have the usual 720p and 1080p files downloaded from the Internet, even 802.11n WiFi should be fine, as long as you are not way too far from the WiFi router. If you are playing from a USB hard drive, then you don’t have to worry abotu anything. Actually, any recent Android TV box will play your files just fine. We have not even started talking about the problems with the S912 chipset and its slow SMB transfer speeds over WiFi yet. 4K forget about it. The regular H96 pro is know for terrible Android Firmware bugs. It really stinks – and now they package such a device in a stick that no doubt will overheat when pushed hard and then WiFi will then cease to work anyway. Will a USB2 to gigabit or 100Mbps ethernet adapter work with the dongle? Will it provide better speeds than the included WiFi? Is there a list of such compatible adapters for this dongle (or S912 in general) and android 7.1.1? Has anyone tried it? I purchased one and just received it and I was wondering the same thing. Hopefully someone will have an answer soon. I haven’t been able to find anything on the Web. Any Ethernet USB dongle is very likely to work on any TV box.